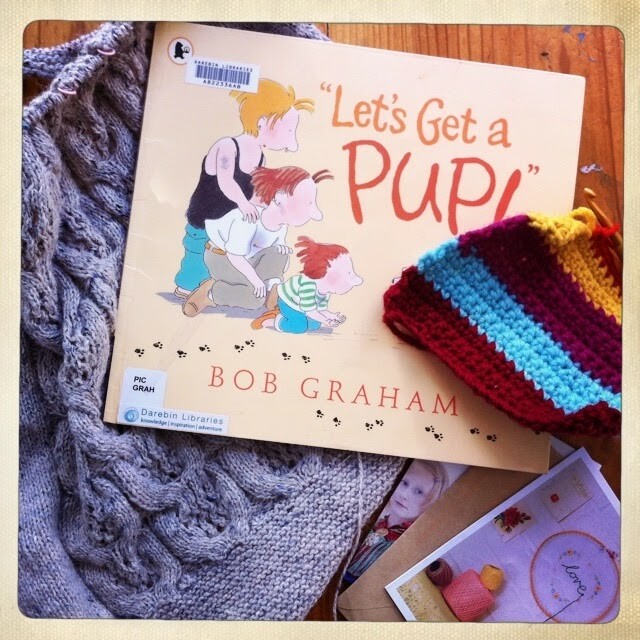 Joining in with Ginny for her Yarn Along: reading Bob Graham picture books, they have so, sooo much heart! and great urban characters and dogs! In his bio, Bob says he likes the sound of dog's ears flapping. When I read his stories to my youngins, I always get the feeling I would like to be this author's friend! I also feel the stories are set in my neighbourhood. On the yarn side of life, plodding away at Hitch!! Still! And also crocheting some samples for a session with the Class 5 children, who are just learning how to crochet. Big thick 16ply wool with 6mm crochet hooks. I also had an inspiration to alter a cardigan I never wore simply because it was a bit gapey with the snap closures and also a bit short, and my kidneys just have to be warm! So! I sewed up the front to make it a pullover and picked up stitches along the rib bottom to add a garter stitch bottom! It's a bit of an experiment, and I'm also going to throw in some short rows at the back so as to get it longer at the back. 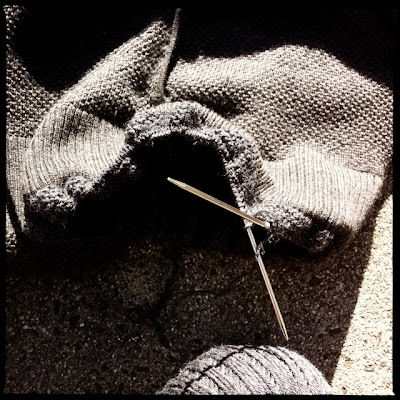 The yarn is Bendigo Woollen Mill Rustic 8ply in charcoal. And we are madly all listening to The Mae Trio's new CD! Gorgeous young women from Castlemaine. Delicious harmonies, songs so fresh and full of heart and gentle humour. hey jo! up too late here, but wanted to say hi! your hitch is looking so pretty, its making me wish for one. 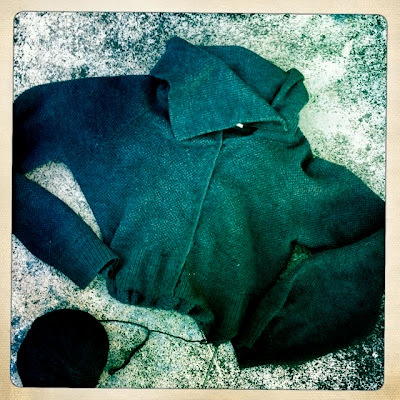 your charcoal sweater experiment sounds and looks fantastic, can't wait to see it done! and where is your cd??! I'm so impressed that you are able to resolve issues to make a knit work...I am so not at that point. Good luck!